Two tonsillar units separated by a septum of connective tissue are shown. The central crypt is lined by a columnar epithelium invaded with lymphocytes (lymphoepithelium). The lymphoid follicles contain mostly B lymphocytes while the interfollicular region is especially rich in T lymphocytes. 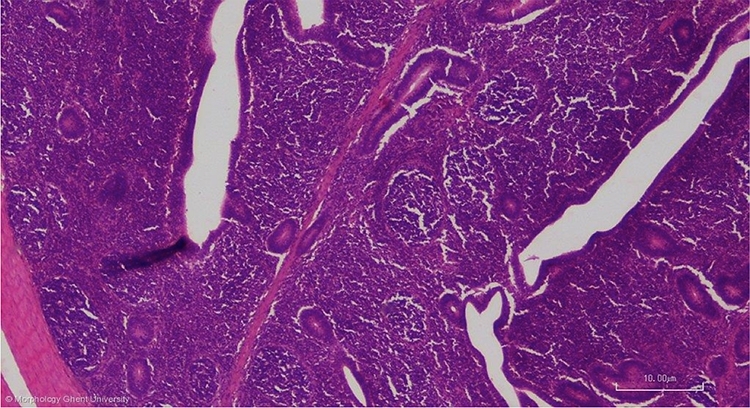 The cecal tonsils are believed to play an important role in the maturation of B lymphocytes in addition to the Bursa of Fabricius.